Exposed brick walls make for a beautiful interior element. When exposed brick starts to look ugly and old you can restore it by cleaning bricks, replacing faulty mortar, and applying the right interior brick sealant. Older interior brick walls that are stained, turning funky colors or experiencing other issues can suddenly loose their charming luster. Turnbull Masonry has transformed many dull and lackluster walls into like new masterpieces. We are happy to clean your wall, replace any missing mortar or bricks, and check the wall for overall soundness. Once restoration is complete, the appropriate brick sealant is applied. The process is fairly simple but the results are incredible. 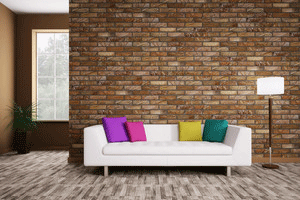 Here are four important steps to properly restoring exposed interior brick walls. If you can tell a brick wall is dirty, it needs some serious deep cleaning. Brick tends to look clean even after it starts getting dirty, meaning it takes A LOT of grime before a brick wall begins to look like it needs repairs. Years of dirt and debris need some serious scrubbing to dissolve. In some cases, gentle power washing methods can be used to clean interior brick walls. Power washing brick can end very badly if the task is not carefully completed using a very low water level. Too much force may create permanent damage to bricks, even stripping off the top layer so that they are more susceptible to damage and have a rough, old look. If using any sort of hose in your house, it’s equally important to prevent a costly flood. Plastic bins, buckets and plenty of plastic sheets will be necessary before any sort of power washing takes place inside. Power washing presents risks to the overall quality of your bricks. While it takes more effort to clean bricks by hand, it might be worth it to avoid potential pitfalls. A stiff brush can be used to scrub at stubborn stains. There are certain products that can be diluted in water to help remove buildups. Try diluting basic grease-cutting liquid soap and table salt in a bucket of water. The gritty salt adds an extra kick to your scrubbing power. Apply your mixture of water, dish soap and salt to the wall and let it sit for around 10-minutes before you start scrubbing. Thoroughly rinse off the wall and wipe clean with a damp rag to ensure all residue is gone. If cleaning tactics don’t do the trick, you’ll need to move on to more advanced restoration methods. If you notice any loose, crumbling or missing mortar between bricks you will need to hire a professional for repointing services. This includes removing and cleaning out damaged portions of mortar and replacing it with a well-matched mortar. Finding the right match is no easy task, especially if you are working with an older wall. If repointing is not conducted on time further issues will arise, such as entire bricks falling out of place. If bricks are spalling, cracked or unsightly, you could have individual bricks replaced. Just like mortar, the bricks must match the original materials in size, shape, color and overall strength. In some cases, the damaged brick can simply be turned around if it is still presentable on the other side. It’s not always easy to remove bricks, even if they look like they are coming loose by the minute. Professional tools and plenty of experience help make the job go by quicker and without the same risks for damage. Once your interior brick wall is clean, repaired and looking great, you don’t want to forget to add the right brick sealant on top. A sealant will help preserve your great looking finish for years to come. Brick sealant may be applied using a paint sprayer, although going over it with a brush or roller is a good way to ensure every inch of the wall is properly covered and protected. There is always the chance that your brick wall has tiny little cracks in it, which are invisible to the naked eye. Sealant actually fills in these microscopic potholes, reducing draft and increasing overall integrity of the wall. Using a polyurethane sealant will create a very glossy finish that tends to look unnatural on bricks. Unless that’s the look you are aiming for, we recommend a brick sealant with a matte finish for a more natural appearance. Turnbull Masonry provides leading brick restoration for newer and historic buildings. Contact us today for a job well done!